Saw a great shirt in the coffee shop this morning: “Man enough to knit, strong enough to purl.” Check out Men Knit and the associated CafePress store. I’ve got a real love/hate thing going with the Sierra Club. On one hand, they’re an important advocate for preservation and conservation, and on the other, they bug me incessantly for money. I’m a member, but I really dislike being hit up for additional donations at every opportunity – I probably get one or two emails a month, plus a phone call every month or two asking for more. Yikes. Had a great trip last night to Sambar in Ballard, which included a fantastic new cocktail: whisky or bourbon (can’t remember), vanilla infused simple syrup, and lime juice. Simple and very tasty. The Weepies were great on Wednesday night – left me looking forward to Peter Mulvey at the Tractor in a couple weeks. Well, I ended up putting an offer in on a condo yesterday, but quickly learned I didn’t get it. There were nine other offers, and the place went for 10% over the asking price – yikes! Back to the search. Lots going on this week – check out The Weepies tonight at the Tractor Tavern and also the Rat City Roller Girls on Saturday evening. Had a nice time Saturday at the Ballard Art Walk, though the bike ride back up Capitol Hill around 11 PM was a little rough. Shouldn’t have had that extra piece of pizza. I’ve been spending lots of time lately on Redfin looking at condos in Seattle. Came close to putting an offer on one this weekend, but ultimately decided it wasn’t right for me. There’s another on the market that I’m seeing again tonight that I’m very interested in. We’ll see how it goes. It’s been a busy week since I got back from New York. I did get around to having my film from the trip developed, though, and there are some nice images. More when I have a chance to scan them, but to start you off, here’s the first – my grandfather in his apartment. I’m embarassed to admit I don’t know who he’s talking to in the photo. 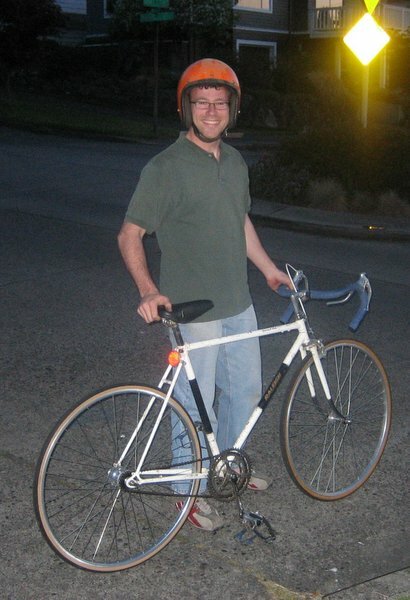 My friend Mike helped me build up a fixed-gear rear-wheel last night. My ride in to work is brief (less than 2 miles), so I thought this would be a good way to get more exercise out of such a short distance – only one speed and no way to coast means plenty of pedaling. It worked really well, and the bike looks pretty sweet without all that extra hardware (which I saved in case I want to switch back). Check it out here (always wear your helmet, especially if it’s orange and stylish).